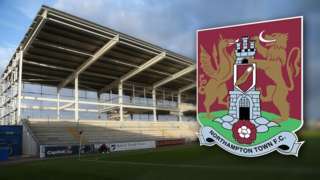 Marcus Antonsson misses a penalty as Blackburn have to settle for a draw against struggling Northampton at Sixfields. 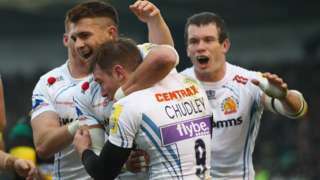 Champions Exeter run in four tries as they win at Northampton for just the second time in the Premiership. 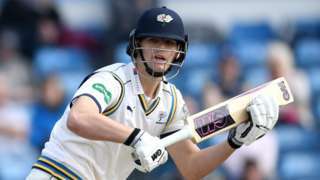 Details of all the county cricket signings and departures from the 2018 season. Highways England says long delays are expected to continue until later this evening, after a lorry-load of beer caught fire. Two out of three lanes are still closed southbound between Cherwell Valley Services and Bicester. Traffic is queuing for about four miles to get past the burnt-out lorry. 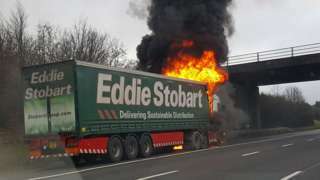 Witnesses say bottles of Stella exploded in the M40 lorry blaze. Traffic is queuing back to Banbury after a lorry-load of beer caught fire on the M40. It happened between Cherwell Valley Services (junction 10) and Bicester (junction 9). One lane reopened southbound at about 12:40 (GMT). One lane has reopened on the M40 southbound following a lorry fire. It happened between Cherwell Valley Services and Bicester in Oxfordshire. On Twitter, Helen Smith said "Driver out but bad vehicle fire on M40. Bottles of Stella exploding! Very scary stuff. A lorry fire has blocked the M40 southbound between Bracknell and Bicester. M1 Northamptonshire northbound severe disruption, between J16 for A45 and J17 for M45 Dunchurch. M1 Northamptonshire - One lane closed on M1 northbound between J16, A45 (Daventry) and J17, M45 (Dunchurch), because of emergency repairs. Traffic is coping well. 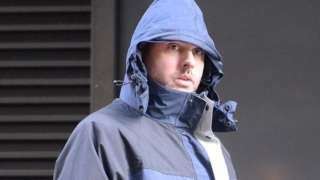 The payment was made in addition to Dr Blantern's contracted salary and terms. M1 Northamptonshire southbound severe accident, between J15 for A45 and J14 for A509. M1 Northamptonshire - Two lanes blocked and queuing traffic on M1 southbound between J15, A45 (Northampton) and J14, A509 (Milton Keynes), because of an accident involving lorry and cars. It could be a working Christmas with a difference for a Northamptonshire Police officer. Det Supt Simon Blatchly has been seconded from the county force as the United Nations Police Commissioner in the West African state of Liberia. A presidential election is in progress there, with a second round of voting likely to take place on Boxing Day. "It is strange seeing Christmas trees in temperatures around 30C," he told BBC Radio Northampton. "It [Christmas] is an important festival here. People try and meet with their families, which will have an impact on the voting because people won't be in the areas where they would [normally be] to vote." Northampton Borough Council's cabinet has met to discuss plans for next year's budget. The budget-setting proposal at the borough council comes against a backdrop of a funding gap of more than £11m over the next five years. The deficit is the result of years of reductions in government funding. 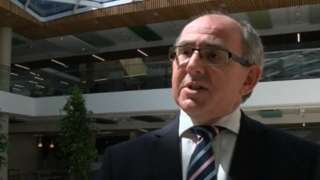 Plans to address this included proposals to increase car parking fees in Northampton by £1 per day along with the introduction of an additional £2 charge at the weekend. A council tax increase of more than two per cent was also discussed. A4501 Northamptonshire both ways severe accident, between Billing Road and A428 Bedford Road affecting A428 Bedford Road. A4501 Northamptonshire - A4501 Cliftonville Road in Northampton closed and queuing traffic in both directions between the Billing Road junction and the A428 Bedford Road junction, because of a multi-vehicle accident. Congestion on A45 Nene Valley Way to Barnes Meadow Interchange and on A428 Bedford Road to the A5123 Cheyne Walk junction. M1 Northamptonshire northbound severe accident, between J16 for A45 and J17 for M45 Dunchurch. M1 Northamptonshire - Two lanes closed and heavy traffic on M1 northbound between J16, A45 (Daventry) and J17, M45 (Dunchurch), because of an accident involving car. 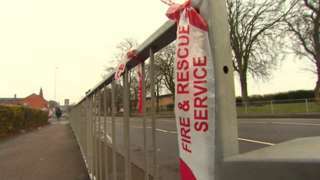 The pedestrian was taken by ambulance to University Hospital Coventry for treatment, but later died. 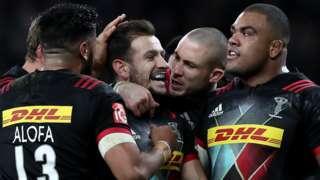 Relive Saturday's Premiership action as Harlequins hammer Northampton and Saracens, Gloucester and Newcastle all win. 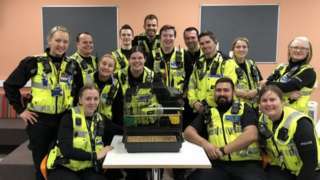 The replacement budgie was named "Craig" after a police sergeant.